An Elematic sandwich wall production line in Bismayh, Iraq. Insulated precast concrete wall panels can address the requirement for thermal efficiency in the region while offering aesthetic facades through colours, textures and exterior finishes, says Elematic*, a leading manufacturer of precast concrete plant and production lines. Thermally insulated façades are increasingly a requirement rather than a recommendation in many parts of the world today. This also applies to countries with a hot climate, as it would mean that expensive air-conditioning is needed to a lesser degree. The efficiency of heating is almost 100 per cent, whereas the efficiency of cooling is only about 30 per cent, which is why cooling consumes substantially more energy than heating. “Cooling can be more than twice as expensive as heating, depending on the technique in use. The importance of energy efficiency is thus about to increase in countries with hot climates,” says Ismo Kallio, vice-president sales at Elematic, which has supplied systems for a number of wall panel factories in the Gulf region. In Dubai, where the Green Building Code set the requirements for thermal insulation of buildings in 2014, energy efficiency is now under increasing scrutiny. Cooling is a major issue in the country where more than 50 per cent of all energy is used to cool buildings. “Regulations are already influencing construction methods in the area,” says Curt Lindroth, area sales director at Elematic Dubai. Thermal insulation is defined by the U-value – an overall heat transfer coefficient that describes how well a building element conducts heat. The government of Dubai requires a maximum U-value of 0.57 W/sq m K, which translates to big savings in cooling system investments in comparison with traditional building methods without insulation. Dubai Precast, a customer of Elematic, has calculated that the required thermal insulation has a payback period of six years in the UAE, thanks to the building’s lower operational costs. In addition to being energy-efficient, sandwich walls also offer nearly endless possibilities for varying the appearance, colour, texture, and architectural aspects of the facades. It doesn’t need to cost much either as an interesting solution can be just as cost-effective as a basic version. Another key factor to consider when deciding on the appearance of the facade is the material used in the concrete mix. Is white or grey cement better, and what will be the natural colour or size of the stone aggregates? These choices will determine the colour and the smoothness (or unevenness) of the façade. Sandwich panels can also be integrally coloured, in which case colour pigments are added to the mix. The moulds used in the production determine the look of the panel surface. Ordinary precast moulds create straight surfaces, but more options are available with the help of extra equipment. Specialised moulds can be used to create different shapes, patterns, and textures. The moulds can be made of wood, steel, rubber, plastic or silicone, and their profiles are extremely varied. The surface structure of the chosen mould will also affect the perceived colour of the wall. The moulds can be unique and tailored for a specific purpose according to the architect’s vision. Even intricate ornaments and sharp lace patterns are now possible by using fibre-reinforced concrete. Because sandwich panels are factory-made, with windows and doors attached as they arrive at the building site, they are quick to install. 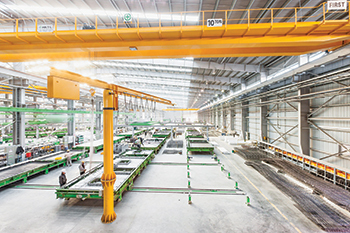 Installation requires a minimum number of cranes and workers, and no scaffolding is needed. The size of the sandwich panels can be small or large, up to two storeys. They reduce costs at the construction site because less manual work and finishing treatments are needed. * Finland-headquartered Elematic, which was established over 50 years ago, offers production lines and equipment for sandwich wall production in three varieties – Semi, Pro and Edge – featuring different capacities and automation levels. All lines are equipped with state-of-the-art tables that give the panels an extremely even surface. Furthermore, a clever shuttering system – FaMe – for straight corners and superior panel quality is available. The company’s production units are in Finland and India. Elematic has subsidiaries and sales offices in the US, Germany, China, Russia, India, Hong Kong and the UAE, and agents in over 20 countries. Elematic’s annual turnover is approximately €100 million ($114 million), of which exports generate 95 per cent, and the company employs roughly 230 people. It has an ISO 9001-certified quality system and the international quality certificate ‘Investors in People’ for the development of personnel.